Well, July had arrived at the old fire hall, and with it came the usual parade of bar-be-ques, benefit dinners, pot lucks, and cookouts that were the defining feature of so many of our lives. It seemed that, whatever the weekend, the only ticket needed for admission to the unending tables of sauce-drenched meats, toasted buns, pickles and onions, ice filled bins of beverages, and frosted sheet cakes was a seven layer salad or a pan of brownies. This particular cookout and the events that followed had their Genesis in two related events. First, when Fire Captain Frank's wife, known around the station as The Real Commander, stumbled upon a supermarket bin filled with bratwursts, cheddar-wursts, and wursts of many other descriptions, marked down to such a low, low price that, for a moment, she thought the store's owners had actually gone crazy. She quickly sent one of her kids back for another shopping cart, filling it with a King's ransom of seasoned, stuffed, natural casing goodness, and then, after a quick stop to pick up Frank's stress medication from the pharmacy, shoved her carts toward the checkout counter and even smiled when the inevitable comment of, “Planning a cookout, huh?” rang in her ears. Thus, like an out-of-control freight train shunted to the wrong track, the seeds of what followed were lain. The metaphorical equivalent of a commuter train of innocent victims was created when Fire Captain Frank, in a moment of less-than-brilliant thought, decided this upcoming cookout was the perfect time to whip up a batch of his Weapon-Of-Mass-Disruption Baked Beans, a recipe that always got a lot of comments when he acted out the kitchen alchemy that resulted in its creation. The spices were perfect, as always; the salt was precisely measured; the pepper ground with Frank's high-end coffee grinder; and the secret ingredient, the key to the success of the WMD Beans, was prepared in a manner perfectly in line with how it was supposed to be prepared. Anyway, a few days later, the regular families gathered around the fire station, and, as burgers were put on grills, pork was put into smokers, and tables were covered in rainbows of plastic containers that most people figured they'd never get back, and the talk around the coolers of beverages of various kinds leaned toward the same discussions that always come up at events like this. People discussed their gardens, their home repairs, their relatives, who did what to whom three decades ago in high school and which teacher gave which detention as a result. As the smoke curled skyward from the various methods that people have devised to cook various animals and people politely made their ways through lines, reaching for dill pickles or sweet, small or large slices of onion, the bowls of Mrs Holter's dill and garlic potato salad, Ms Breitner's bacon-stuffed jalapeno's, Mr Desmond's oatmeal monster cookies, and, of course, nearly everyone took a scoop of the Captain's WMD Beans along with their choice for the best of the wurst. Soon, children were chasing Rory the Rescue Dog around the lawn, accompanied by calls from various parents. While the warning voices chorused, “Are you sure you want more then half a cheddar-wurst and two bites of potato salad? You'll be hungry later!” or “You took those extra onions, you eat them.” or “Is this your lemon cake, dear? How come you never make it this good at home?” a few sharp-eyed folks noticed the wisps of smoke seeming to come from the ranch house on the other side of town, up the hill, by the water tower. Most everyone dismissed it as more people having another cookout of some kind, probably making something they didn't really want to share with their neighbors. A few rhetorical questions were posed as to the dish being served: Prime rib? Pork loin? Leg of lamb? A bacon explosion? The possibilities were as varied as the colors of dishes on the salad tables. Gloria, the wife of the fire station's Hazardous Materials tech Hubert, was involved in one such conversation when, quite suddenly, she stopped in the middle of a sentence about the right way to grill turkey legs as a strange look took possession of her face. Without another word, she sprinted for the unisex restroom inside the fire station, the door slamming behind her on its adjustment-needing spring. She was but the first domino. Within five minutes, more then a dozen people of various ages and food choices were either doubled over on the ground, groaning in obvious distress or banging on the bathroom door, pleading with Gloria to hurry. In the center of the chaos, Maxine, who had worked as fire company's Medic for the last three years, was triaging victims as fast as she could, barely keeping up with the new cases as they staggered, or were carried, over. Moments later, the station's longest serving Veteran fireman, Vinny, jogged up to Maxine's rapidly expanding pile of patients, and, with a few points and comments and bits of advice, seemed to increase her efficiency by about 25%. Vinny, as always, didn't seem affected by the food, but that was a point of pride around the firehouse. He had made up so many batches of his four-alarm chili, five-alarm short ribs, and even the occasional batch of six-alarm pickled eggs that, for all intents and purposes, his stomach must be made of the same stuff as their protective suits. Except for his usual insulated mug of industrial solvent strength coffee being replaced by a can of beer from the discount liquor store, he was an island of calm and control amid the vomit and cries for mothers and moans of regret. Before Frank even had the chance to glare at his abashed-looking wife, the alarm went off. The warbling shriek calling them all to their jobs of saving lives, extinguishing fires, protecting structures, and, occasionally, keeping submarines from sinking. A few people glanced up the hill at the ranch house and its supposed cookout, now revealed to be what it truly was. Smoke billowed skyward and a number of people gasped as five distinct explosions rocked the house. A few minutes later, the firetruck started up its siren, then rolled out the door and up the street, carrying a motley assortment of firemen, each knowing that, for this mission, there would be no backup, and that they, alone, would have to carry the day. They arrived at the now burning house just as the ambulance pulled up beside them. Vinny jumped off the truck to talk to a policeman standing outside while the others went about their jobs, getting hoses off the truck, hooking into fire hydrants, and getting ready for the battle to come. “What's the story?” Vinny asked the man in blue. Everybody started off on the black 8 side of the house, since that seemed to be the place most under threat early on. My plan was to have the CAFS and Generalist carry the bulk of the fight while the Veteran kept both of them in range so they got their bonus actions. 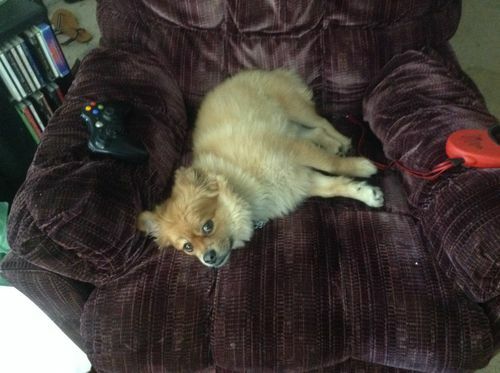 He would extinguish the occasional space on his own, but his main duty was to act like an anchor for the front line advancing through the house. The Medic would act behind the front three, running back and forth, treating victims and escorting them out, while the Driver would shift the truck as necessary, keeping the fire in the other half of the house under control until I got to it. Step one was to chop a hole into space (4,8) and haul out the Hazmats. 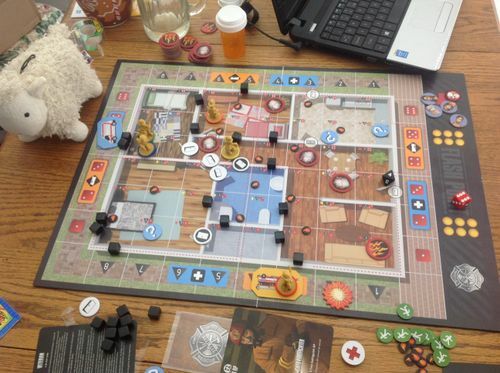 As the Generalist, Veteran and CAFS worked their way down the hall, extinguishing the fires there and in the adjoining bedrooms, the Medic first treated then rescued a victim ( The Cat!! ) and then returned to haul the first hazmat outside. Soon after, the Generalist got the second one out, as well. Meanwhile, the driver shifted between the two locations on the other side, keeping down the fires in the front room. Despite this, the third hazmat exploded as a result of some bad driver fire and some flashovers, adding a few new hotspots and pinning him down for a couple turns while he dealt with it. The driver even managed to extinguish a smoke counter at (1,4), which I could have rerolled, but, since I'd debated more then once whether to send the Generalist over to deal with before it got worse, I figured I'd take the result and be happy. This game should also be a warning to people to vacuum their hallways well, because (4,5) and (4,6) kept spawning smoke tokens. Thankfully, the Veteran was usually right there to deal with them. More thankfully, no hotspots showed up there, otherwise this might have been a shorter game. 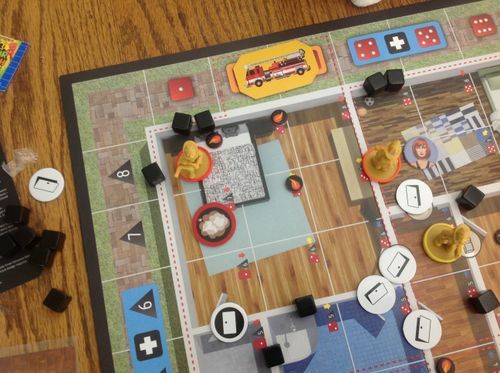 Around this point, two POI showed up in the kitchen, and, with both the Medic and the ambulance on the other side of the house, the Medic jumped in the ambulance and moved one space clockwise. As she was dealing with those, one of which was false, another POI showed up in the back bedroom, near (6,7). Since the Medic was busy and the fire seemed under control for the moment, the CAFS got nominated to haul the resulting victim, with encouraging shouts from the Veteran, outside through the initial breach. Meanwhile, since almost everyone was now in the front of the house, the driver shifted his attention (and his truck) to the rear, spraying down some smoky areas before they became trouble. 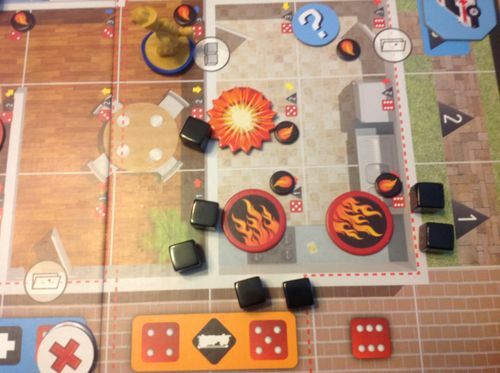 As an earlier explosion blew another hole in the back wall, rather then mess with rolling dice, the Driver made use of a couple of saved actions to grab a bucket, run in, extinguish a smoke counter, and get back to his truck in a single turn. Once the Medic got the POI's in the kitchen taken care of, she headed over to the living room where two more had appeared. I have to admit that I was getting fairly confident at this point. I had a pile of victims saved, there were only three POI tokens left in the draw stack, the CAFS had gotten his victim to the ambulance space and was back to doing what he does best, the Generalist and the Veteran were keeping things under control in the front rooms, and, because of a lack of suitable targets, the driver had actually spent his entire turn moving the ambulance from the front of the house to the back to grab the CAFS's rescued victim. The Medic had treated one victim in the living room and gotten her out to an ambulance spot and someone, though I don't remember who, spent a couple of actions to get the ambulance one space away. As the Medic went back to get one more victim treated and out, it happened. 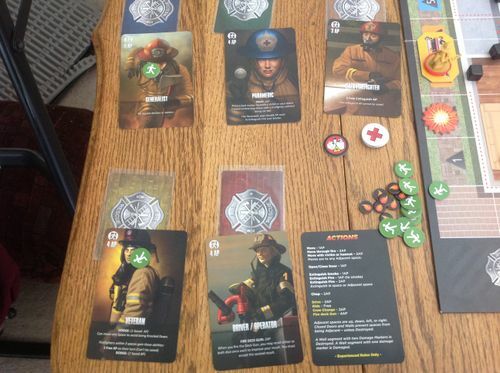 I rolled a fire spread action and rolled (5,1), which was already on fire. Explosions aren't ever good, but this wasn't as bad as it could have been. The walls are damaged, the fire spreads, and the hotspot reroll gets rolled. No problem! I've got four damage cubes left! My dice, ever ready to mock me, stop on, yet again, (5,1). O.K. Stacked explosions are never, ever good. Now I'm down to one damage cube, the walls are blown open, and I've got yet another reroll for hotspots. Well, the rest of the house is pretty clear of fire, so even a little flashover shouldn't hurt me too much. I roll the dice one last time. (5,2) cruelly stares back at me. Of exactly three spots on the board on fire, I roll one of them. Now, to be fair, I'd been really lucky with avoiding hotspots on spread rolls for most of the game, but if this is the way I've got to pay it off, I'm not sure I want that kind of luck! The third explosion uses up my last damage cube, the house collapses, and I suffer the ignominy of defeat, yet again. Just two more actions and I could have had that seventh victim saved!! One more round and I might have gotten eight or nine out! The Veteran-CAFS-Generalist combo is a powerful one! Those extra actions, especially for the CAFS, really get him where he needs to be. I still haven't had to use the Veteran's dodge ability, but I suspect the time for that is coming as well. I'm one who doesn't believe the Driver is as super-powerful as others seem to. Yes, he's useful, but that whole OSHA (Or whatever it is!) rule about not spraying in occupied areas can hamstring him pretty quick if the fire decides to spread out through a building. If it's concentrated in a few places, though, he can work on one spot while the other players work on the other. And, of course, there's my old friend and ally, the Medic, who seems to always be on the board when I'm playing. Except for this scenario, I almost always play with the critically/lightly wounded victims, so she is often a must have to have any chance of saving some of them. This was a hoot of a scenario, and I'd encourage everybody to give it a try. I wear my Halloween costume all year round! Hehe, this is my favourite line! I'll admit that, if I hadn't gotten them as KickStarter bonuses, I might wonder myself. Try proxying somebody as the Veteran and give him a shot. That bonus action ability is pretty powerful in 4+ player games. The dog, to me, is a more specialized tool. On some maps, he's great, on others, especially ones with a lot of doors and small rooms, he's not worth much. On the other hand, the possibility of spending 18 actions in one turn is pretty tempting!